These tender slices of New York Strip flavoured meat in gravy are designed specifically for small dogs and formulated to meet 100% of their nutritional needs. Made with high quality protein that is easy to digest, they also provide a source of moisture, which helps maintain urinary tract health. 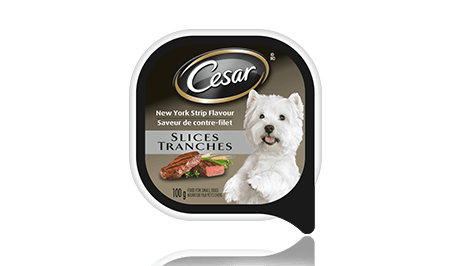 CESAR® SLICES: NEW YORK STRIP FLAVOUR 100g is rated 3.0 out of 5 by 1. CESAR® Slices New York Strip Flavour in Sauce is formulated to meet the nutritional levels established by the AAFCO Dog Food Nutrient Profiles for maintenance. CHICKEN, LIVER, BEEF, MEAT BY-PRODUCTS, WHEAT GLUTEN, STARCH, WHEAT FLOUR, PEA FIBRE, MINERALS, SALT, SODIUM TRIPOLYPHOSPHATE, COLOUR, VITAMINS, NEW YORK STRIP FLAVOUR, GUMS, SUFFICIENNT WATER FOR PROCESSING.